This term occurs three times in the Old Testament (Ezek. iii. 9, Zech. vi. 12, Jer. xvii. 1), and is used as a translation for shamir. Although no definite idea can be gathered concerning the identity of the substance intended from these passages, it is possible to determine its nature and the uses to which it was put. A very hard substance is clearly indicated in all the passages, and in Jer. xvii. 1 it is compared with the engraver's tool of iron. In the two other passages it is used figuratively to express an unyielding, stubborn, and defiant spirit. The diamond can not be meant by Jer. xvii. 1, for the diamond was not used for engraving by the ancients, and indeed it is doubtful whether the diamond in its polished form was known to them. 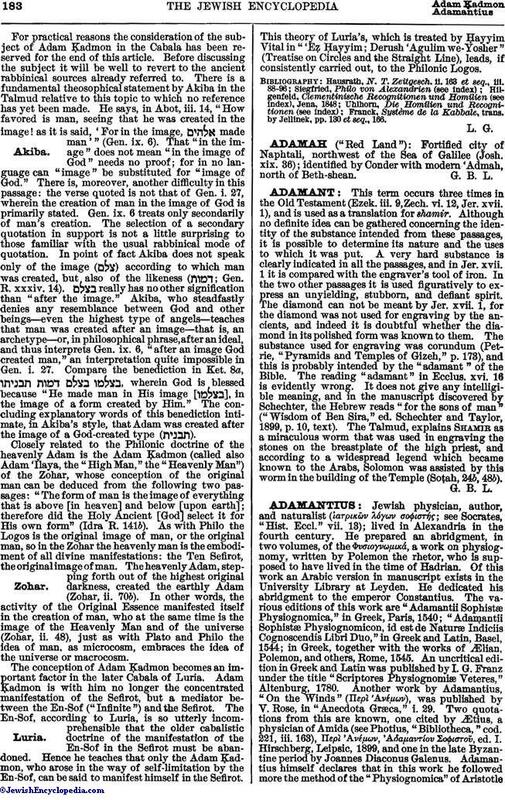 The substance used for engraving was corundum (Petrie, "Pyramids and Temples of Gizeh," p. 173), and this is probably intended by the "adamant" of the Bible. The reading "adamant" in Ecclus. xvi. 16 is evidently wrong. It does not give any intelligible meaning, and in the manuscript discovered by Schechter, the Hebrew reads "for the sons of man" ("Wisdom of Ben Sira," ed. Schechter and Taylor, 1899, p. 10, text). The Talmud, explains Shamir as a miraculous worm that was used in engraving the stones on the breastplate of the high priest, and according to a widespread legend which became known to the Arabs, Solomon was assisted by this worm in the building of the Temple (Soṭah, 24b, 48b).